Mama Nibbles: New Fiber One Chewy Bars Kids Will Like! New Fiber One Chewy Bars Kids Will Like! Looking for a snack that combines the taste kids’ love with the nutrients they need? New Fiber One Chewy bars are the perfect wholesome snack that the whole family will enjoy! Available in Chocolate and Strawberry PB&J varieties, these chewy bars are perfect for in-the-house, on-the-go, and everywhere in between. Complete with a peanut butter or chocolate bottom and yummy drizzle in every bite, kids won’t be able to resist the taste and parents won’t be able to resist the nutrition of this enjoyable snack. These bars are SO new that the packaging has yet to be designed. The winner's prize pack will contain bars in unmarked boxes and packaging. 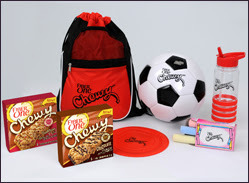 One winner will receive all that is pictured above!